Time for a new Destrachan update. Another completely unrelated project with a tight deadline came in between, but today I’ve continued working on my Destrachan creature. The project that came in between is finished, and I’ll be able to post about it in two weeks when I’m allowed to publish it. 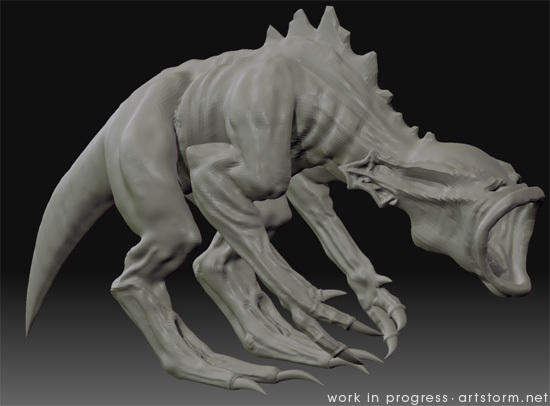 Anyway, continuing from the last post, where I had modeled the base mesh in LightWave 3D, I’ve now brought this guy into ZBrush and started sculpting. I’ve worked my way from subdivision level 1 and are currently sculpting at level 4 and are working with around 90.000 polygons at the moment. At level 4 I’ve got enough polygons to start getting finer details sculpted into my creature like veins, tendons, skin folds, muscle definitions and the like. I intend to keep sculpting all the way up to level 7 to get this creature extremely detailed down to pores and skin texture, before I export it back as a low resolution mesh with a displacement map to use in LightWave. Oh well, I just wanted to post this update tonight, and will continue sculpting for a few hours now and will hopefully be able to post the final sculpt tomorrow, so I can start painting my little cute and cosy darling. hey, this is great. but i don’t remember this creature from the monster manual. hope you don’t mind if i somewhat document the progress. i’d like to link the pics as before and after as you go along. i’m sure that some traffic will come this way. I think they ended up making at least 3 monster manuals. But this guy is from the first manual, page 49-50. :) Cute little one! No, I don’t mind at all if you do that, quite the opposite. And I’ll try to make the rest of the posts in this project as informative as possible.